Finally An Original Story That Doesn't Involve A Superhero! When you think about classic movie images, you may picture Scarlett and Rhett, Dorothy and the munchkins, or perhaps Cheech and Chong with that huge blunt. But one of the most iconic shots in the history of cinema has to be King Kong perched on top of the Empire State Building, regardless of which movie you imagine him in. And sure, if you have seen any of those films, you know that Kong was taken from his home island to be used as an attraction in a show, but did you ever wonder what his life was like well before that? A new film aims to shed some light on that. Hit the jump for the details! In Kong: Skull Island—set for release next year, per this page—we will finally get to know Kong before he became a Broadway star. Presumably, we'll see how he lived, what his day-to-day activities were like (when not fighting dinosaurs), and maybe we will even be introduced to some family members. 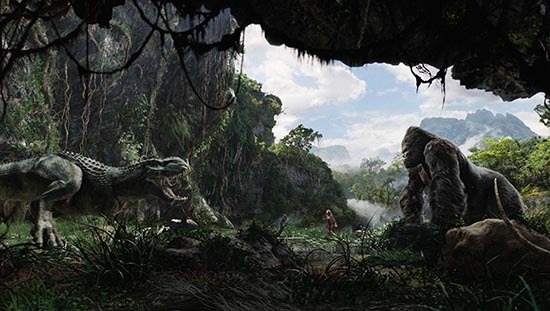 And Skull Island, while connected to Peter Jackson's 2005 film, will be, in some regards, a departure from the traditional story. For one thing, the movie could have much more of a modern feel, star Tom Hiddleston told Variety in an interview. "It’s not set in the '30s,” Hiddleston said. "There's no movie director with a map. There’s no out-of-work actress down on her luck. All of that stuff is respected, we're just trying to do something new with the myth because Kong is an icon of movies. I think he's someone people want to see again." While Kong can certainly carry a movie on his own, Skull Island will just be the warm-up act for an epic confrontation planned for 2020. That's when he will face Godzilla in another film. If you are a Kong fan and don't want to wait until next year to see him in action, never fear! You can go back and watch the different film versions or, if you want to get a little more interactive, there are some Kong video games you can play, such as Gala Bingo's Kong Scratch hosted here. This scratchcard game features Kong himself, of course, along with other memorable characters and themes from the films. And then there's the console game based on Jackson's movie, and it may be just as good as the film. In this one, you get to play from different points of view. In first-person shooting action, you play as Jack Driscoll and have to use weapons and traps to stay alive in a jungle swarming with monsters. In third-person action, you get to be Kong himself and have to use his strength and agility to defeat his enemies. The game looks amazing, and if it makes you think you are in a movie, this isn't by accident, as Jackson worked closely with game makers to craft it. If you are feeling particularly nostalgic, you can always dust off your old copy of Donkey Kong (or find it online) for some throwback, King Kong-related fun. However you choose to remember the giant ape, it'll at least serve as a means of holding you over for his next tale, which (as we wrote above) is sounding pretty damn good. I'm reading: Finally An Original Story That Doesn't Involve A Superhero!Tweet this!